That’s right folks! Our Bioshock Infinite Steam CD Keys are now in stock available to pre-order at just £26.99. You will get the key instantly after your payment and you can activate the serial on steam, which will give you a full digital download of the game. For just £1 more, we also offer the bioshock infinite pre-order version key which includes the industrial revolution and bioshock 1 download via Steam. Immediately after your payment, you will receive an instant download link at our Autokey Page. When you visit our autokey website page, you will be presented with a unique steam activation key for Bioshock Infinite. All you need to do is enter this bioshock infinite steam key into Steam and you will be granted to a full digital download of the game. The CJS-CDKeys website is totally automated which means that there is no need to wait for staff to manually email your key, as is required by many of our competitor websites. With CJS CD keys, the whole process of purchasing your Bioshock Infinite steam key is totally automated from start to finish. Just Pay, collect key, Activate, and download. Our price of £26.99 for the Bioshock Infinite Steam CD Key is the best price currently available on the internet. It’s over 30% cheaper than the Steam price, yet you receive exactly the same product instantly! 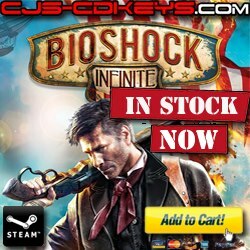 CJS CD Keys means you really have no reason to pre-order Bioshock Infinite on Steam! Get the exact same product and service at a fraction of the cost. Click here to Buy Bioshock infinite Steam Key now!